EPISODE ORIGINALLY BROADCAST: Saturday March 30th, 1985 from 10:30pm to 1:00am. 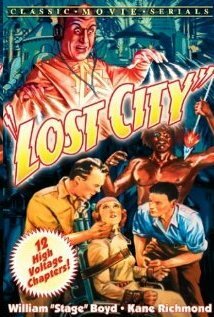 SERIAL: Prior to showing and mocking the movie Randy Clower and Richard Malmos, the show’s machine-gun wielding “Film Vault Technicians First Class” showed an episode of the notoriously campy sci-fi serial The Lost City (1935). That serial featured a super-scientific city lost in the middle of the African jungle plus zombified “giant” African tribesmen, ray-guns, a slinky femme fatale and a tribe of pygmies. There’s also a Great White Hunter as the hero and a mad scientist whose inventions include a machine that turns black people into white people! And the “colorization” is considered a REWARD for tribesmen who serve the mad scientist well! All this plus BOTH William Boyds in one serial! THE TUNNEL WITH THE MINIATURES OF MULTIPLE VAULT DOORS THAT OPENED AS THE POV CAMERA FILMED THEM. 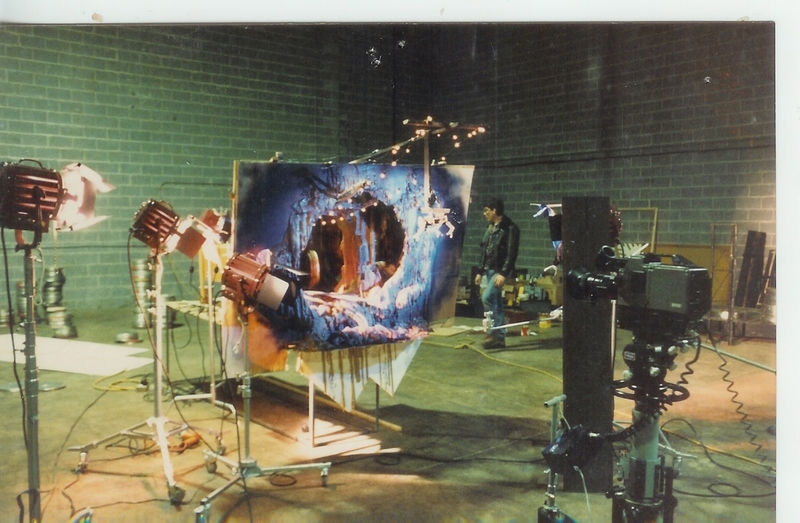 FILM VAULT LORE: One eye-catching element of The Texas 27 Film Vault was the POV shot down a tunnel of various vault doors which would open in turn as the camera approached them. It’s another aspect of the show that had Vaulties feeling deja vu when MST3K debuted years later. The shot was achieved through miniatures, of course, and Randy Clower was kind enough to provide me with the behind-the- scenes photo shown above. 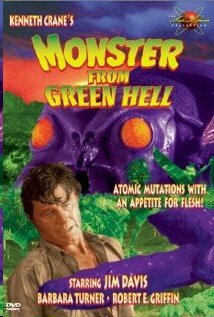 THE MOVIE: Monster From Green Hell was one of the many, many “Big Bug” films of the 1950’s. 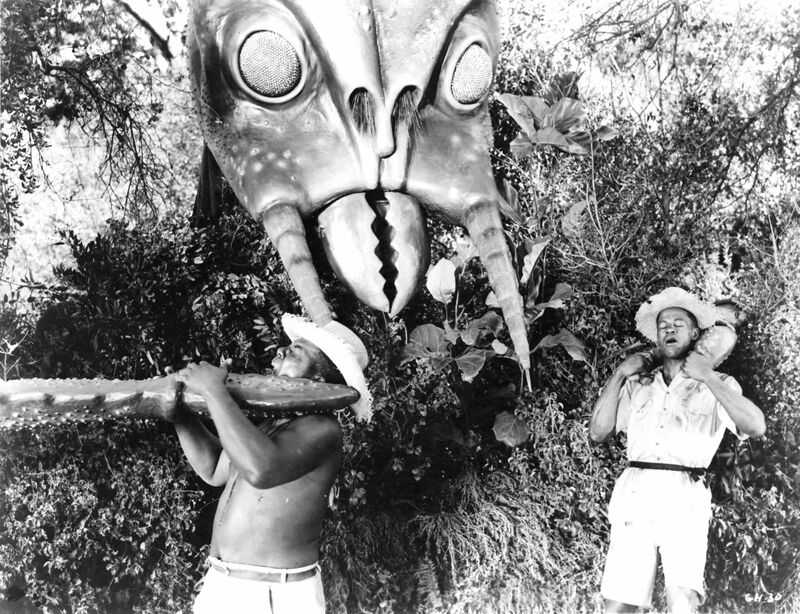 Most of those “bugs” on the loose were mutated to giant size by atomic radiation but in this flick it was cosmic radiation instead which was the culprit. Two scientists at a desert testing lab featuring the WORST “paintings masquerading as scenery outside a window” in film history are launching rockets with various life forms aboard. They do that to test the effects of exposure to cosmic radiation on those life forms. One of their rockets malfunctions and crash-lands in the “Green Hell” portion of Africa after exposing its wasp passenger to cosmic rays for over 40 hours. 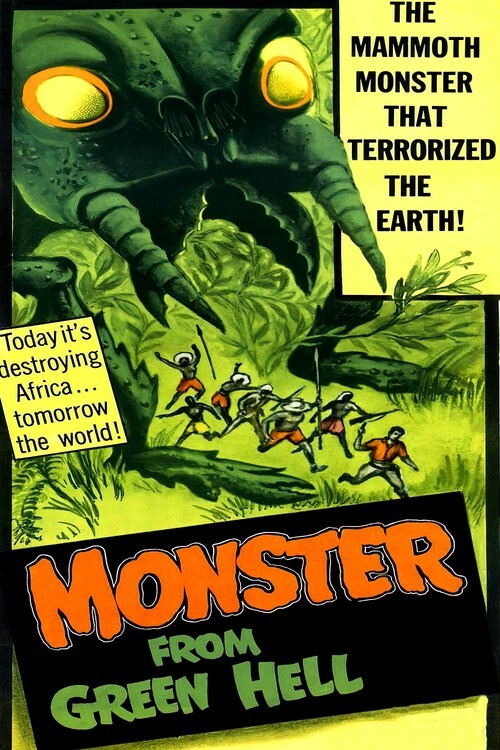 Since this is a 1950’s monster movie the effect all that has on the wasp is to cause it to grow to enormous size and start rampaging through the jungles of Africa, prompting Mothman-style tabloid news stories around the world. Back in the U.S. the scientists from the beginning of the film believe there might be something to the monster sightings and set out to investigate. Cue a stereotypical White Bwana jungle safari that features pith helmets, native bearers and Italian actor Eduardo Cianelli as an Arab guide! The movie also sports one of the all-time ridiculous examples of a caucasian portraying an Asian. William Demarest looks as Asian as this guy. Hell, it’s not til he starts talking in pidgen-English that you even realize he’s not supposed to be another bland white guy. At any rate the wasp has laid eggs which have hatched, bringing forth a bunch of additional giant-sized wasps, all of which look as phony and plastic as their parent. These marauding monsters threaten to overrun Africa and beyond, imperilling millions of lives. Some hastily-edited footage at the end shows the gigantic insects getting destroyed by a VERY convenient volcano eruption after our ineffectual heroes fail at fighting the creatures. Along the way is a lot of the usual bad movie fun, in this case including the sight of buildings off in the distance in what is supposed to be hundreds of miles of jungle. For trivia lovers Bronson Canyon shows up yet AGAIN in a b-movie and the head scientist is played by Jim Davis aka Jock Ewing on Dallas, so Randy and Richard’s usual Dallas and Gang Busters jokes would have presumably flown like shrapnel. © Edward Wozniak and Balladeer’s Blog 2014. Unauthorized use and/or duplication of this material without express and written permission from this blog’s author and/or owner is strictly prohibited. Excerpts and links may be used, provided that full and clear credit is given to Edward Wozniak and Balladeer’s Blog with appropriate and specific direction to the original content. Fantastic! 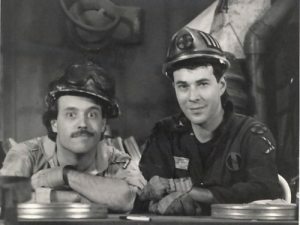 This show really was Mystery Science Theater 3000 before it was on the air! Thanks for commenting! Feel free to spread the word! I miss shows like this from back in the States.